A luxurious body moisturiser, free of SLES (Sulphates), Parabens and Petrochemicals formulated to hydrate skin without stripping its natural oils leaving it soft and radiant. Blended with organic aloe Vera juice for anti inflammatory properties to protect the skin and deeply moisturise. Lemon Beetroot Extracts acts as a natural skin conditioner and brightens the complexion. Pure Essential oils of Rose and Jasmine refresh nourishes , leaving the skin healthy toned. Explore the entire range of Moisturisers available on Nykaa. Shop more Kama Ayurveda products here.You can browse through the complete world of Kama Ayurveda Moisturiser. Explore the entire range of Lotions & Creams available on Nykaa. 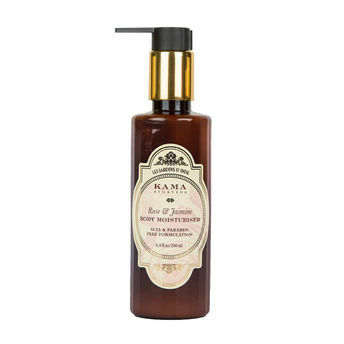 Shop more Kama Ayurveda products here.You can browse through the complete world of Kama Ayurveda Lotions & Creams .